As a child growing up in Washington state, I received an entomological nickname. My father, in a take-off of the name, Kate, affectionately called me "Katydid." Maybe Katy did. Maybe Katy didn't. 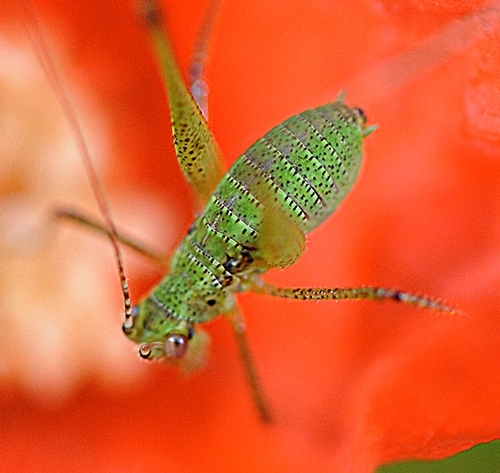 Scientists classify katydids in the phylum Arthropoda, class Insecta, order Orthoptera, and family Tettigoniidae. Agriculturists consider them pests; stone fruit growers try to eradicate them from their orchards. 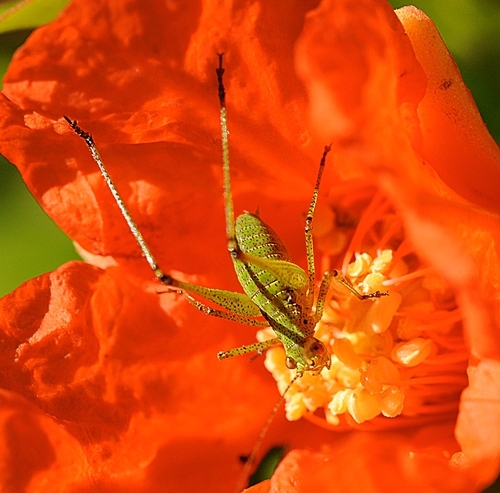 So, was I surprised last week to see a katydid tucked inside one of our pomegranate blossoms. Honey bees, yes. Leafcutter bees, yes. Sweat bees, yes. At first glance, the green critter resembled an exotic Walt Disney cartoon character: long, awkward-looking hind legs; long, threadlike antennae; and beady eyes. Yes, a katydid. A juvenile. Maybe, just maybe, we'll someday hear the sounds of "Katy did. Katy didn't." Maybe Katy will. Maybe Katy won't. Luv your story... très cute & touching! In truth, I say this because growing up, I didn't experience this "kind" of respect from my parents... So, it was really nice to read about and sense the existence of the "Love", albeit vicariously. Thank you.